With such a complex show, which was designed to be a compelling visual feast and which would require absolutely perfect synchronization between performers, stage elements and effects, a producer’s thoughts quickly turn to the capabilities of BlackTrax real time tracking technology. That was certainly the case for Redline Technology. The overall design concept for “Zhao 2018 Chaoyin Release Night”saw a falling planet as the centerpiece of the production, with its motion initiating a range of startling lighting effects that powerfully amplify the story with its themes of love, loneliness and impetuous youth. Redline used a disguise gx2 media server in combination with Panasonic PT-SRZ31KCprojectors and a BlackTrax system. The tracking setup included 13 infrared tracking cameras and 11 infrared LED tracking points positioned around the sphere to track it during the performance. 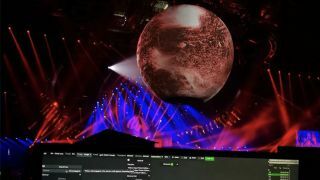 "Redline's creative design proposal for the show was a moving planet, which was achieved by integrating the BlackTrax tracking system and disguise system on the moving planet in the centre of the stage,” recalls Jack Sun, founder and managing director of Redline. “As the planet moved, images changed in response to the movement in real time – which amazed the audience. Its flexibility, mobility and openness made BlackTrax a perfect choice for this project." BlackTrax demonstrated once again that, for anyone looking to create an immersive, engaging, thrilling visual spectacle, it is truly indispensable.